Represent Your South Carolina Bikers Rights with ABATE of South Carolina on Lobby Day! Don’t miss the opening day of the 119th General Assembly happening in Columbia, South Carolina! Join ABATE (A Brotherhood Against Totalitarian Enactments) of South Carolina for Lobby Day, happening on Tuesday, January 11, 2011, and make your voice heard to your public servants in Columbia. 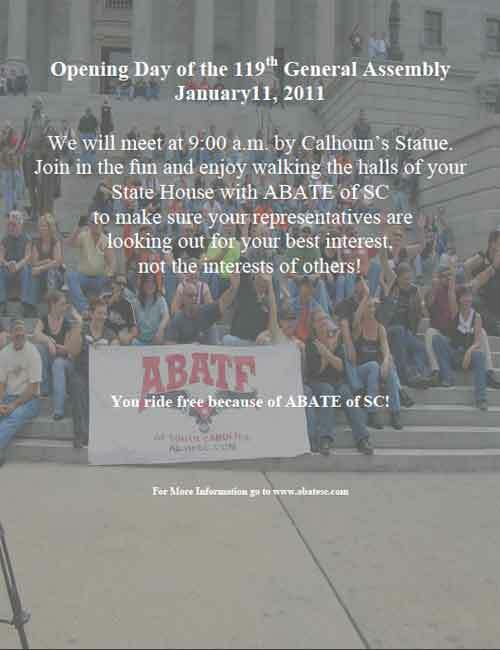 If you’re interested in joining ABATE and representing your rights and South Carolina biker rights, ABATE will be meeting on Tuesday, January 11, 2011 at 9 a.m. in front of the Calhoun statue at the Columbia State House (1101 Gervais Street, Columbia SC). During Lobby Day, you’ll be able to travel through the halls of the State House, with ABATE and their followers, to ensure that our public servants are looking out for our best interests and our rights. To RSVP to this event, visit the ABATE Facebook page, here. Or share this post with your friends on Facebook. For those of you who might not be familiar with ABATE of South Carolina, they are an organization based in South Carolina that represents the rights of motorcyclists across this great state. To learn more about ABATE of South Carolina, visit their website. Don’t forget to share this post with your friends on Facebook and spread the word!